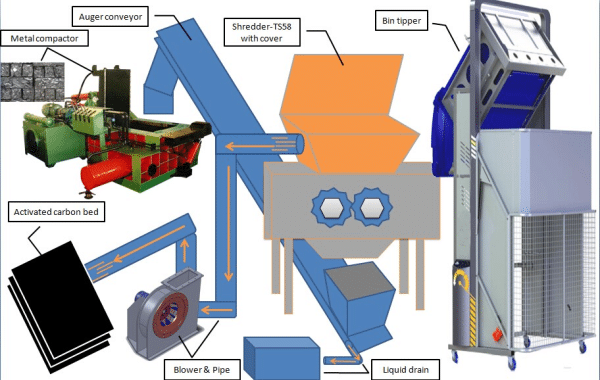 The Aerosol Shredder Unit (Series ASU500 and ASU80) is used specifically for draining, crushing and containing VOCs from household waste aerosol cans with the goal to reduce hazardous waste seepage into landfills, contain the VOCS to prevent OZONE degradation, and to provide a size reduced metal that can be further recycled. SRS offers Cycle throughput range from 250 - 6,400 cans per hour. Aerosol cans are loaded into the staging hopper or conveyorized staging hopper. The operator activates the aerosol can crusher. A clearing cycle is done to confirm that all residual cans left in the chamber are cleared. Cans are loaded from the hopper automatically and placed in the crushing chamber. All residual liquid in the can is discharged into a 55 gallon drum. All vapors are pressurized through the drum and into the dual inline carbon beds. The empty crushed can is discharged directly underneath ASU into a 55 gallon open drum or pail. When the system detects that the can has been crushed and discharged, it releases another can for crushing. Each (ASU500 & ASU800), is built to Class 1 Division 1 Standards (explosion resistance package). The Unit is designed with non-sparking stainless steel shredding teeth to reduce the chances of sparking. Meets Class 1 Division 1 or Atex Standards . 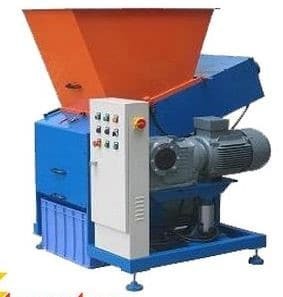 Designed to be a low speed shredder to reduce heat friction. The ASU unit can reduce 4,000 cans in an 8 hours shift. The Aerosol Shredding Unit (ASU800) shreds up to 800 cans per hour. Based on an 8 hour day, the unit can reduce 6,400 cans in an 8 hour shift. This can drastically reduce your aerosol waste build up. The metal then can be separated from the liquids and you can recycle the metal for profit. The (ASU500 & ASU800), is set up with (N2) nitrogen solenoid and flow meter. A selector switch offers the customer the option to run in automatic or manual operations. When the customer starts the unit, the selector switch is in automatic. The N2 purge blankets the shredder teeth to remove oxygen, reducing the one of the three elements that can cause explosion. Vacuum blower removes aerosol vapors to the customerâ€™s carbon bed or thermal oxidizer. Each unit is non-sparking with an explosion resistant motor (Class 1 Division 1). The blower can move from 100 CFM to 300 CFM, removing the maximum vapors to the customer set location. Cylinder positioning sensors detect jams and will automatically engage an operation to release the can from the jam and discharge it. The PLC controller (ASU500 & ASU800), does a self-diagnostic check of the overall unit to make sure proper functioning conditions are met. If at any point, one of the many internal safeties are not met, the indicating fault light comes on to notify the operator of a problem. The unit will not start until the problem is resolved. It can be as simple as manual valve that was turned off, to an unsafe level of LEL. Once resolved, the unit does a self-diagnostic check again and returns to operations. Maintenance screen displays all manual activations of the instrumentations on the system. This allows maintenance staff to manually activate all functions on the system. For example, the maintenance staff presses the button "Seal Change" on the maintenance screen which enables the cylinders to adjust and move to a position which allows access to change the seal with ease. o Discharge conveyor can be added to remove shredded metal to large bins. o A bailer can be added to turn shredded metal into cubes for ease of palletizing and to reduce the overall size. By bailing the shredded metal, you can reduce storage space needed and can save you money.